If what you want is a 100% tobacco substitute that is an organic natural blend, nicotine free, easy to roll thanks to the finely chopped leaf, guaranteed not to leave any aftertaste, and certified by an independent laboratory to contain no formaldehyde or DDT, that lights every time easily, as well as uniformly, we have just the product for you, Real Leaf Organic Herbal Tobacco. 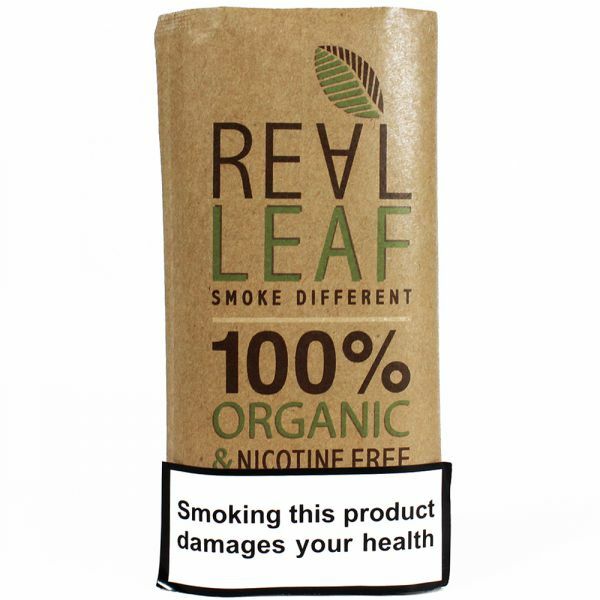 Real Leaf was established in 2012, and has become a global leader in the tobacco substitute industry, since when they have successfully delivered some of the best handcrafted tobacco-free herbal blends to people around the world. It is known that throughout history, people have used a mixture of different plants for medicinal purposes and we still do, but now we find that smoking herbs, which has been common in many cultures, has recently gained attention from scientific research, because it is known that herbal mixtures do not emit some of the harmful compounds found in normal cigarette smoke. This particular blend of herbal tobacco includes 100% red raspberry leaves, marshmallow root, and mulleins, designed to ensure that your smoking experience is going to be cleaner and far more enjoyable. Real Leaf Organic Herbal Tobacco works really well combined with any other smoking blends and its nicotine free blend includes 100% red raspberry leaves, marshmallow root, and mullein, sure to provide you with a delicate texture and aroma. Real Leaf Organic Herbal Tobacco is the perfect tobacco substitute for you! There are many reasons why more people are enjoying herbs, not through the tradition cigarettes or using a bong, but vaporisation, the way that the true connoisseurs do. Using a vaporizer is much healthier the herbs not being burnt, this way the vapour in haled is not contaminated with small particles of plant matter. Another very important reason that people are turning to using vaporisers is that it is less wasteful far more efficient and uses less herbs. Naturally you have the outlay of the vaporizer, but you would have the same with a bong and other devices. There are many styles of vaporiser to be found at our web pages and each one has its own particular advantages such as a discreet pen style to the Volcano which is proving to be a popular choice for home table top use. We did not think that this could be improved, but it has and it is now available in digital format. The Volcano Digit Vaporizer has a large LED display which very precisely will tell you just the operating status at any time, giving actual and set temperatures. The control is electronic and is extremely accurate and the range can be set between 40° and 230°C with an accuracy of plus or minus 1.5°C. The Volcano Digit has a two year warranty and is sold complete with a herb grinder. A 21st century choice for discriminating people. 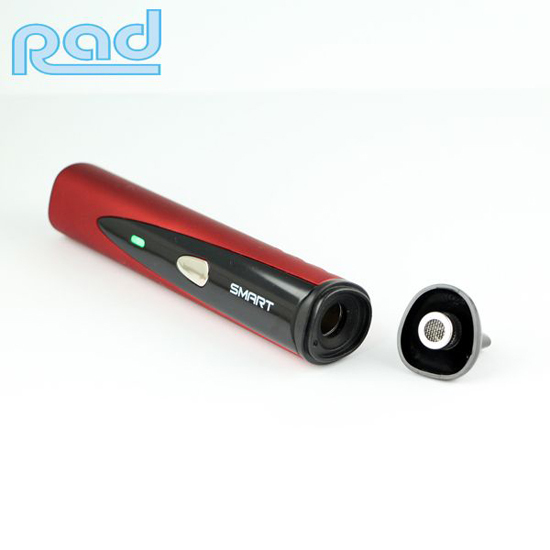 The Smart Portable Vaporizer by RAD has been specially designed to be one of the most efficient and easy to use vaporizers on the market, and it certainly lives up to the hype. This highly portable device features three different heat setting so you can get the right temperature for your herbs, making it highly efficient while getting the most out of your herbs. Fully re-chargeable thanks to its advanced lithium battery, the Smart Portable Vaporizer can provide up to an hour of vapping action from a single charge. To use, simply fill the chamber with your chosen herbs, clip it back together and turn it on. The different heat settings can be controlled by holding the button down for 1-3 seconds and it even features coloured LED’s so you know what it’s set to. The red LED is 182°C, the green LED is 193°C and the blue LED is 210°C. 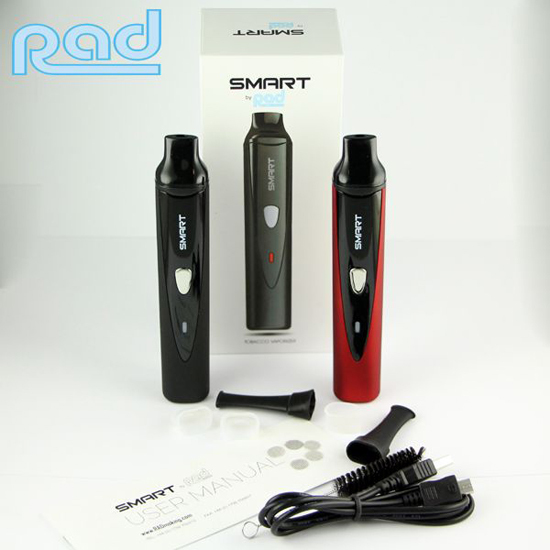 The Smart Portable Vaporizer by RAD is available now for £84.99 and is an ideal accessory for those who like to enjoy their herbal mixtures on the move. 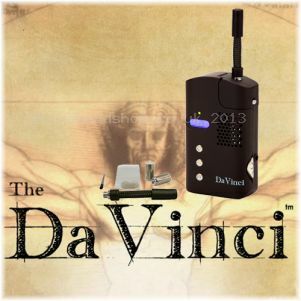 The Da Vinci Portable Vaporizer is set to become one of the must have smoking devices in the world; it’s compact, discrete and effective at providing the best hit possible. This compact vaporizer has a digital temperature display allowing users to dial in the correct temperature for their specific herbs and oils, providing better efficiency. The Da Vinci Portable Vaporizer comes complete with two oil canisters specially designed for use with oils; simply fill the canister with your chosen oil and pop it in the chamber, easy! The unit is compact enough to be taken just about anywhere and has storage compartments for an oil canister and cleaning tools. It comes complete with a rechargeable battery which provides up to one hour of continuous use. What’s more, the Da Vinci Portable Vaporizer can be used when charging the unit so you’ll never miss a hit again. The Da Vinci Portable Vaporizer comes with a fully illustrated instruction manual and is available now in black, white and grey for £164.99. Shisha Pipes have been used for hundreds of years as a smoking device and the Mecha Shisha Pipe is one of the best looking shisha pipes we have in our shop. This two foot tall glass shish pipe is a great focal point for any room and its long stem and wide base ensure that you get a great smoke every time. The glass base is adorned with fantastic etchings and the stem has shiny false crystals to make it bling in the light. All of the parts of the Mecha Shisha Pipe can be dismantled for easy cleaning and maintenance. Using a shisha pipe is easy, simply fill the bowl with your chosen smoking mix, cover with tin foil or a shisha screen, add some coals, light and enjoy. The Mecha Shisha Pipe is available now for £44.99 and we have a full range of herbal smoking mixtures and accessories to go with it. Volcano Vaporizer – Simply the best! The Volcano Vaporizer by Storz & Bickel is regarded by many as being one of the best vaporizers on the market, and with a feature list like this it’s no wonder. 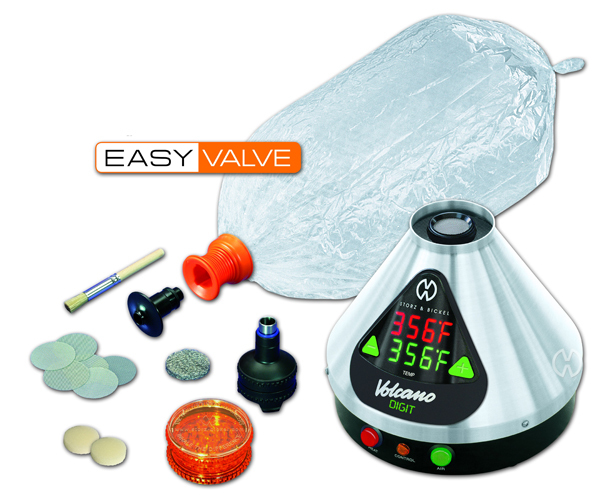 The Volcano Vaporizer features a balloon and valve system as opposed to other vaporizers that use hoses or tubes; this provides a more leisurely smoke and ensures that nothing is wasted in-between inhalations. • Turn on the leave to heat up to your desired temperature for 3-5 minutes. • Fill the chamber with your chosen herbal blends and pop in on the top of the Volcano. • Push the green button and attach the balloon. • Remove the balloon when it’s inflated to the desired level and inhale. 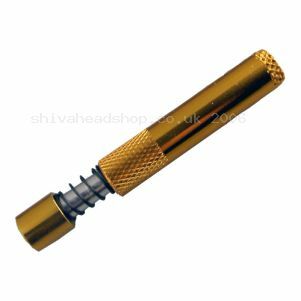 The snap on mouthpiece ensures that no vapour is lost in-between inhales and is perfect for passing around a group of friends. The Volcano Vaporizer comes complete with a 3 year guarantee and a free herb grinder so you can mash your herbs up into manageable pieces. 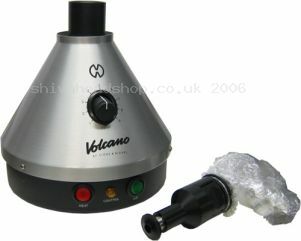 The Volcano Vaporizer is available now for £319.99 and really is the crème de la crème of vaporizers. Looking for a compact and efficient vaporizer to take with you wherever you go? Then I give you Da Kube Portable Vaporizer. Designed to be as compact as possible, but with the same efficiency of a standard vaporizer, Da Kube Portable Vaporizer is the perfect device for travelling. Da Kube Vaporizer is really easy to assemble and use, and provides you with a great hit every time. To use simply sprinkle a small amount of your herbal bend into the centre of the bowl, slide a battery into the battery bowl and apply some pressure to it; the vapour will start to form within 5 seconds meaning that you can start to inhale through the glass draw stem. The kit contains everything you need to get started including the vaporizer itself, 2 rechargeable batteries and charger, cleaning brush, glass draw stem and travel bag. 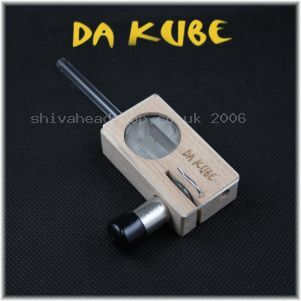 Da Kube Portable vaporizer is available for just £69.99 and is a great addition to your travel smoking kit. Some of the best ideas are simple, and that’s exactly what the Better-Bat is, simple. The Better-Bat is a one hit pipe that is super easy to use and clean. To use, fill the pipe head with your chosen herbal mixture, light and inhale. Once you have finished simply push down on the end of the pipe and all of the left over debris is ejected, ready for the next hit. The Better-Bat also comes with a grinder tip, perfect for making your smoking mix more manageable. To use the grinder tip place a small amount of your smoking mix in your hand and use the grinder tip to grind it into a finer powder. The Better-Bat Grinder Tip is available in small (55mm) and regular (80mm) sizes and cost £8.99 and £9.99 respectively. Please Note: Colour may vary from the picture below. Harem Shisha Pipe – a traditional smoke! 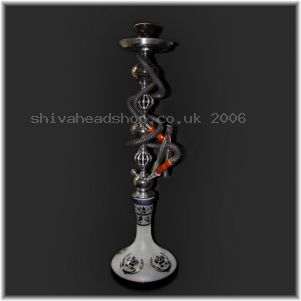 The Harem Shisha Pipe is one of the most luxurious looking pipes in the Shiva Head Shop range and stands an impressive 20 inches tall. This traditional pipe has a glass base and is decorated with gold painted flowers, which makes it look more authentic. The smoking hose has a reach of 40 inches and when not in use, sits securely onto the pipe with the rubberized holder. The traditional clay bowl sits perfectly on top of the pipe, providing ample room for your shisha smoking mixtures. To use the Harem Shisha Pipe simply, fill the bowl up with your chosen mixture, cover with a Shisha Charcoal screen (available separately), put your coal on top and light. 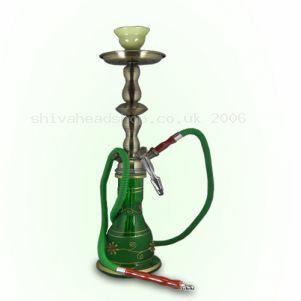 The Harem Shisha Pipe has 20% off for a limited time, so why not pick up a bargain for just £30.39. Please Note: colours may vary from the picture below. Adding yet more bling to your smoking and culinary arsenal, these fantastic herb grinders not only look good but get the job done. As their name suggests, the Gold Spinner Grinders logo spins like a set of 50 Cent’s wheels and instantly improve street cred. These herb grinders effortlessly pulverise your herbal blends into manageable pieces with their super sharp teeth that are guaranteed to for many years. The built in mesh separates the smallest pieces into the bottom of the grinder; these are usually the most potent parts of the herb and can be stored away for a special occasion or used straight away. The Gold Spinner Grinder also comes with a handy scraping tool, so that you get all of your herbs and keep your grinder clean in the process. 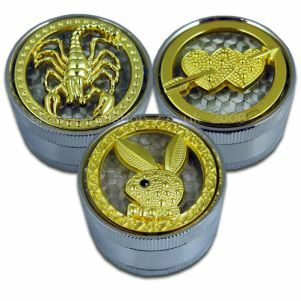 Gold Spinner Grinders are available for £14.99 each.